After the soggy spring and a series of heat waves interrupted by monsoons, we are all looking forward to a quiet late summer and fall. It is somewhat traditional for Chesapeake Bay boatshops to have a summer lull between the frantic commissioning season and the winter lay-up season. This year seems to be an exception. Probably one of the reasons that Rob’s shop is so busy is that he and his crew are completing three new models this summer. The custom CY55 project is moving forward one step at a time. 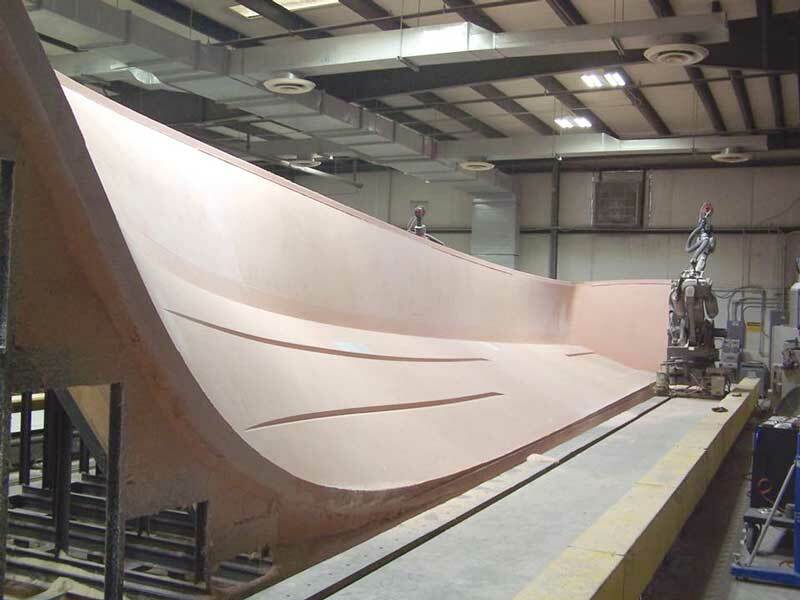 The limited use foam hull mold being built by ATI in Virginia is complete, except for some final fairing and should be delivered to Rob’s Cambridge location and bolted together within the month. The CY46 hull is completed and is in the shop having electrical and plumbing systems installed. The Seakeeper stabilizer is ready for installation. The first half of the limited use mold for the new CY55 at ATI in Virginia. The cabin and deck assemblies are being built and a system to allow easy access to the engines is being worked out. The CY34 is also out of the mold and is having her cockpit deck installed and a plug made for the express deck. Add to all this the frustration involved in trying to build an additional building and repowering a small surplus landing craft for the U.S. Veterans Fishing Adventures with a Suzuki 350, and it’s no wonder Rob doesn’t feel a slump. Joe Reid at Mast and Mallet in Edgewater, MD, sends us this newsy update. “Part of our indoor space is occupied by a Cape Dory Typhoon. This 18-foot wonder of a sailboat, with a full keel and classic lines, is receiving a makeover inside and out. All hardware and teak wood are removed for cleaning and repairs to the gelcoat. Fresh paint is to be applied throughout. All teak wood trim will be replaced and the original bronze hardware reinstalled. Another classic in the shop is a 1956 Chris Craft Holiday model. It is in for new floors and vinyl flooring to be installed. Fresh varnish in the interior is to be applied. The Calvert Marine 1936 draketail departs for her annual haul out at Washburn’s Boat Yard in Solomons, MD. Shown here are shipwright George Surgent (L) and volunteer Ed Richard. Shepherd is not a boat manufacturer name you hear much about in our area. The Shepherd Boat Company was founded in 1928 in St. Catherines, Ontario. While marketed primarily in Canada, after 1949 Shepherd began an aggressive sales campaign in the upper midwest states. 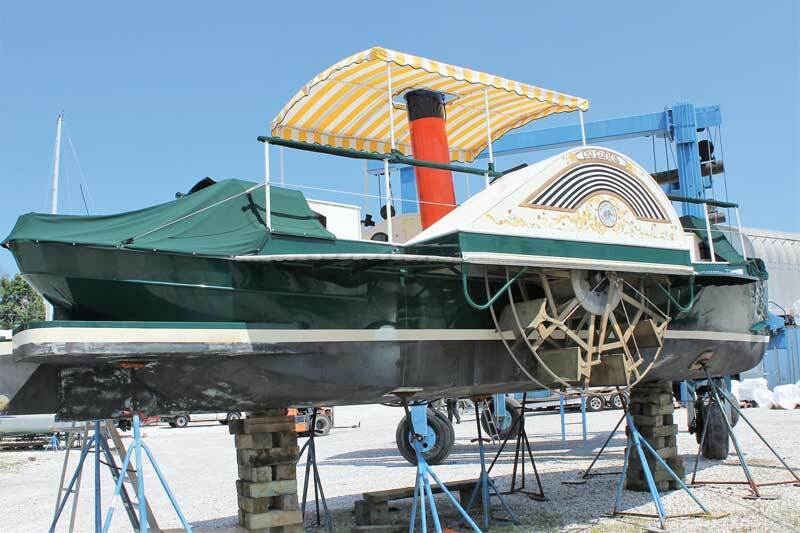 The company was known for innovative design and well-constructed mahogany runabouts, offered in either direct drive or VEE drive configurations. In 1966 the company was sold to Trojan in Pennsylvania, and the name pretty much disappeared. Recently the company name has reappeared in Wisconsin and specializes in custom wooden runabouts. 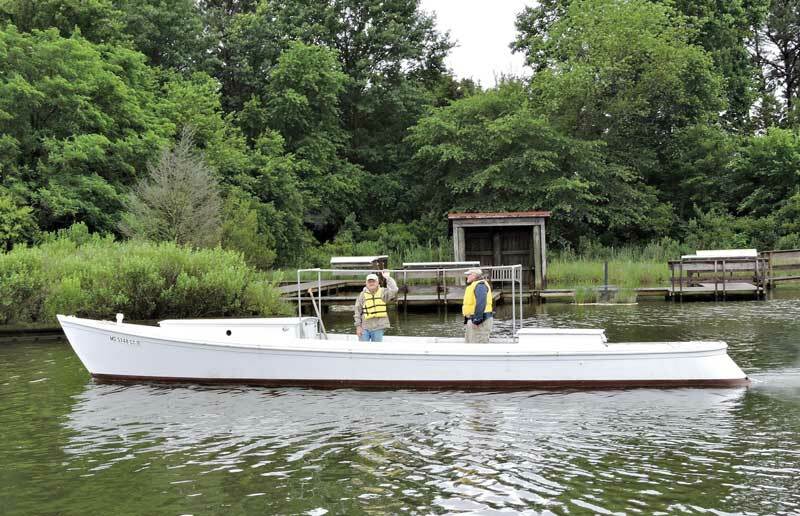 Dave Hannam’s report describes a Shepherd 17-footer, hull # 74. This is most likely one of the last wooden Shepherds to be built. 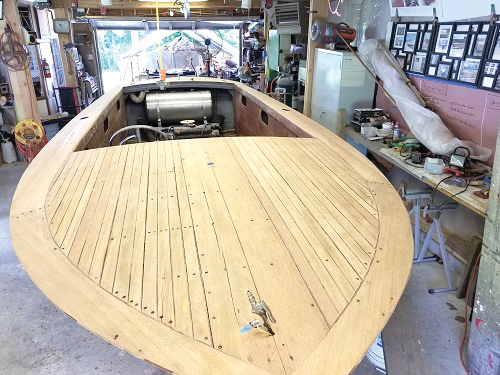 A 1966 Shepherd runabout with a newly refastened deck at Classic Watercraft Restoration in Annapolis, MD. 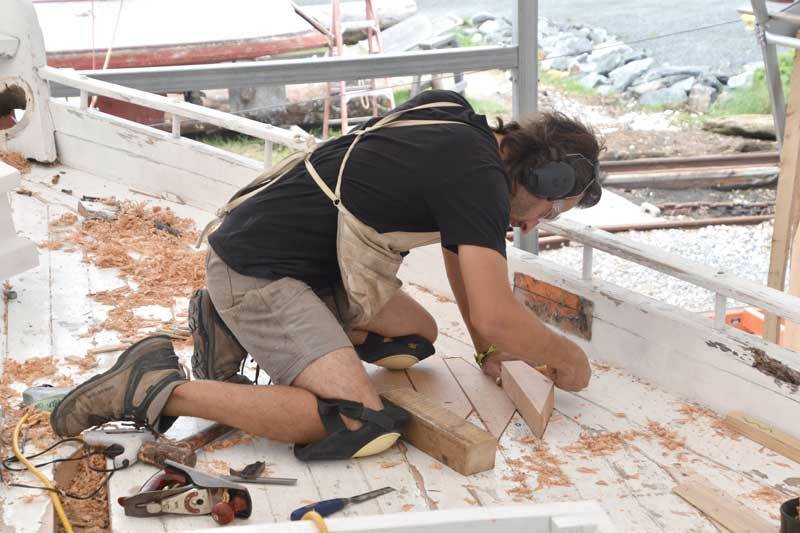 Shipwright Joe Connors caulks the deck on the bugeye Edna E Lockwood at the Chesapeake Bay Maritime Museum in St. Michaels, MD. “The team has been restoring CBMM’s queen of the fleet by replacing her nine-log hull, in adherence to the Secretary of the Interior’s Standards for Historic Vessel Preservation, since 2016. Shipwright apprentices working on the project are generously supported by the Seip Family Foundation and the RPM Foundation. That’s it for this month. Enjoy the rest of the summer.